FROM meth lab busts, cannabis hauls and the well-publicised war on bikies, Gladstone Police have been in the thick of it for much of 2013. Gladstone CIB detectives were responsible for a significant crackdown on the drug trade in the region, as Operation Kilo Prophecy, a 12-month investigation, struck a massive blow to the illegal drug production and distribution trade in the area. Detective Senior Sergeant Luke Peachey said the results were satisfying, knowing the amount of man hours that had gone into the operation, but warned those involved in illicit drugs that detectives would not be resting on their laurels. 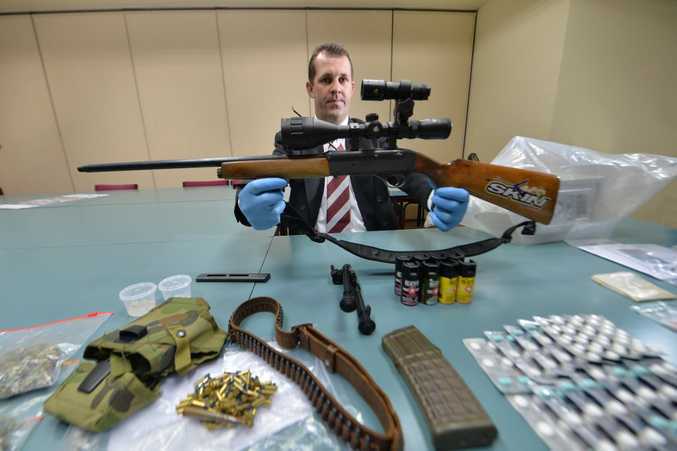 "The amount of illicit drug labs we found during the operation and the amount of people we charged with trafficking, we'd hope put a dent in the drug trade within Gladstone," he said. "However, as I've stated numerous times, we won't be sitting on our hands. Our proactive approach towards policing those sorts of offences will continue." When asked about certain cases that held significance for his team, Det Snr Sgt Peachey said the raid of a clandestine methylamphetamine lab at a Smith St residence, not once, but twice, as being one of particular significance. "There was one case where we twice found illicit drug labs at that location in Smith St, and what that indicated to us was that the production of methylamphetamine had been going on for quite a period of time," he said. Det Snr Sgt Peachey said the recent number of sizeable cannabis hauls were another sign of headway being made by local detectives, and he vowed to continue the detection of illegal crops. "There's been a number of hauls down the Rosedale, Agnes Water area at the moment, and a lot more people are speaking freely to us and we're getting information which we would ask to continue," he said. "It appears there's a number of people down there who may be producing dangerous drugs, namely cannabis, and our efforts to detect these people will continue." As well as the strikes against the drug trade, Gladstone detectives were part of the state-wide crackdown on criminal motorcycle gangs. Det Snr Sgt Peachey said the New Year would not bring respite for those who continued to operate outside the law. "We support these laws 100%," he said. "We obviously acknowledge that there are motorcyclists out there who are just those, motorcyclists. "However, we don't believe you need to be a part of a criminal organisation or gang to be a motorcycle enthusiast." The top detective said criminal motorcycle gangs would still be monitored to ensure members were not obtaining income from illegal means. "Whether they're working in covert is yet to be discovered. However, our actions towards them will continue to be proactive and we'll continue to monitor them closely," he said. Det Snr Sgt Peachey praised the efforts of his staff in 2013 in securing the positive results against the region's drug problem. "For a regional CIB we've achieved outstanding results this year," he said. "The fact we've charged so many with trafficking and the fact we've conducted an investigation in Prophecy for a 12 month investigation and had those results is a credit to my staff." He reiterated that detectives would remain vigilant, and they were not done when it came to taking those acting outside the law off the streets of Gladstone. "We hope to take a few more people off the streets next year, so if you are doing the wrong thing out there, your time is very limited and we suggest you either pack up and move somewhere else or you cease doing it straight away," he warned. The conclusion of the 12-month Operation Kilo Prophecy, targeting the illegal drug trade in Gladstone. 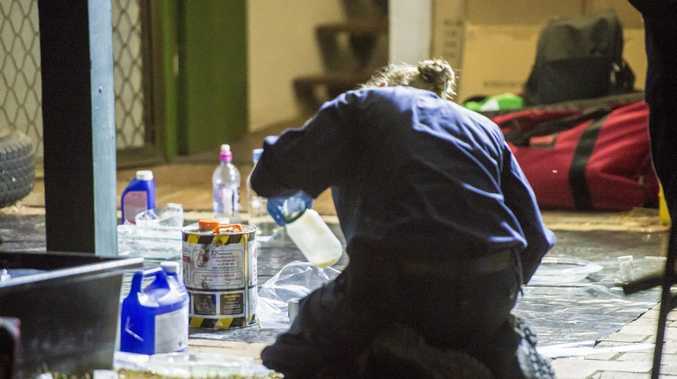 In July-August a number of raids were carried out in the area, uncovering numerous clandestine meth labs, drug hauls, and weapons and ammunition caches. One significant clandestine lab was raided twice in Smith St, leading to the jailing of at least two people and putting a significant dent in local methylamphetamine production. In late November a number of illegal cannabis hauls uncovered in the Agnes Water and Rosedale areas, thanks in part to information from the public, including a commercial setup owned by a 62-year-old Agnes woman.